Memorial Day seems to kick off summer just when it is needed each year. Yes we live in Florida, but believe it or not the ocean isn't in our backyard. Whether you live in the Sunshine State, or the middle of the Show Me State (Missouri for those of you who aren't smarter than a fifth grader!) you can bring the ocean to you with some backyard fun. 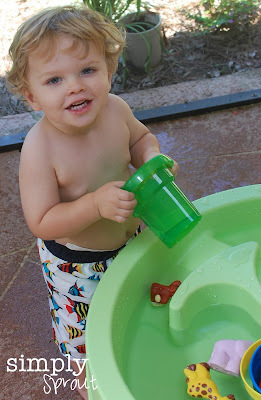 Mack and I headed to the porch for a little post nap water time and we soaked up the fun! We recently purchased a basic water table (for under $30) for him with the thought that I could add whatever I wanted to it as he grows and learns about new things. Since this was his first time playing with it, I let him have fun exploring. Of course like every little boy that means dunking things, splashing, pouring the water out, but no worries because we were having a whale of a good time OUTSIDE! To make it a little more educational we gathered items in a bucket to see what would float or sink. Sorry, I don't have a picture of our items because the oceanographer decided to dump them all out at once. We rounded up an apple, a drumstick, a crayon, and a toy to test out. Of course a 20 month old isn't going to grasp the concept of buoyancy, however he did notice things that went straight to the bottom. He also noticed that his apple was floating as he tried to scoop it up. He finally succeeded and decided he need a snack. If you were playing with water with older children you could have them construct a boat out of aluminum foil or modeling clay. They could then test their best buoyant design. While you're by the "ocean" take a fishing break, "Goldfish"ing that is! He is loving counting every thing in sight, so these little snacks make for great counting manipulatives. They happen to be yummy too! We couldn't finish off our Mommy and Mack time without some art. Finger painting can look scary messy to most parents, but don't discount the benefits of messy play. Allowing children to be "dirty" and "messy" without the stress of being scolded is very important. While being messy and painting they're encountering a variety of different textures, developing hand eye coordination, and their fine motor skills. 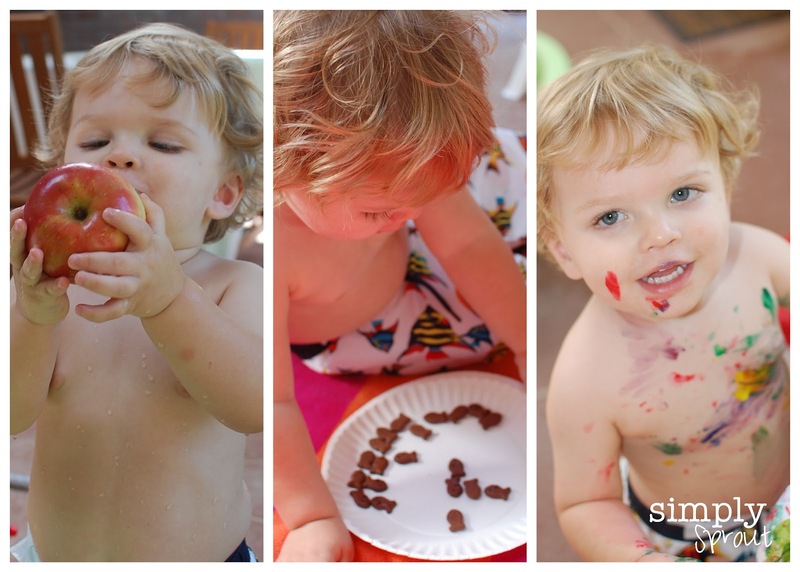 Finger paint cleanup is nothing that a garden hose can't handle. 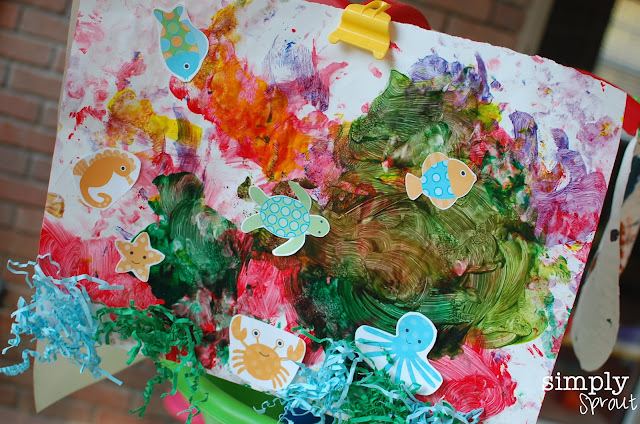 We used his dried painting to create the underwater backdrop for his ocean masterpiece. I found some cute sea life online, printed, cut and put a dab of glue on the back of each shape. Mack then plopped them down to create a sea life ecosystem. I drizzled a little more glue along the bottom of the page (which of course he thought was finger paint) and let him place the crunchy paper to make the ocean floor. So whether your at the beach or your backyard, have a ocean play date with your child. On Wednesday during our Lil Sprouts book club Marcy is going keep our attention under the sea, and we can't wait for our ocean themed Lil Sprouts event this coming Saturday! Wow, What a masterpiece! He's quite the artist!